Includes the Vive headset, two wireless controllers, two base stations, link box, earbuds, Vive accessories, safety guide and warranty card. 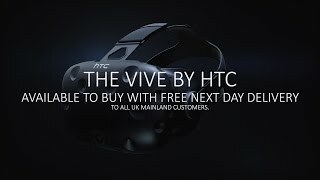 More links for "VIVE VR Headset UK"
Expensive toy, but what a toy it is. Let's not beat around the bush, this is a toy, there is not 'but's' and 'ah's' that will convince me otherwise, but dam, what a toy it is. I will not try and explain what the experience is like, it wouldn't do it justice, all I will say is that I was astonished by how different it makes gaming. Yes its all jolly to shoot up some zombies on your computer's monitor, but to actually believe you could touch them? It's a whole different game. As for the hardware itself, you can see the pixels, or more prominently the dots between the pixels, but after a few seconds you forget they are there. I can imagine next generation of headsets will make these pixels even smaller if not make them non-existent. The headset, controls and sensors feel like they have some quality to it, I've already bashed my controls a few times by mistake and they are fine. As for the controls, it amazes me how accurate they are in the virtual world, when compared to the real world, by this I mean if I look down at my controls in VR, and could see through the headset, I would be looking at my hands / controllers and not empty space. It really does allow you to be immersed in the games. Comfort wise, I can go long a while wearing the headset, with and without my glasses on. I can't see this being a reason not to buy the headset. The only major problem** with the headset is not so much with the headset, but rather with the state of the market for VR in general. It is still a novelty item with a small fanbase, so quality games are far and few between as few publishers are jumping on the VR train at the moment (Although bethseda are planning a fallout 4 VR game, which has me hyped as a big publisher getting involved with VR can only be a good thing). Anyway, Be prepared to find just a handful of games you like and sink hours after hours into them. Good headset with the only downside being a lack of content ATM, but the good news is content is coming soon. Great immersive expirience. I am disapointed by the panel type being pentile which makes the space between the pixels noticeable on that resolution. PSVR has almost double the amount of subpixels and the space is not noticeable. If you have at least 1.5 by 1.5 (Although some games require a 2m by 2m setup) and have the money to buy one without instantly regretting seeing that chunk leave your hands, then the Vive is a must have gadget. After having it for nearly 2 months i have some niggles. The problem (for me, at least) is not the Vive itself. 90% of the games on the market are just tech demos. If most of these games were developed for PC without requiring a Vive, they would either be free to play or cost between £2 - £10 for the pleasure. However, a lot of these tech demos are charging full price (By full price i'm talking between £20 to £30). There are some gems out there that are totally worth that price... But there are a lot that are not (I suppose the same could be said for games in general, but this is a different league). There are a lot of free to play games on Steam for Vive but can leave alot to be desired. Overall though, the experience is just something else. I cannot recommend enough to book some time to have a demonstration at Overclockers before you buy. so I was a early adopter back in april I got one direct from htc, during the festive time a deal was on and I knew that htc had tweaked with the headset abit and had made things better so I couldnt resist to get a second one. as normal OC did their part very well giving me next day delivery Free and I had it in my hands less than 24hrs later well done guys everytime its a pleasure. I have been aware of industrial room scale VR solutions since pre-2000 and even had a chance to experience a partial implementation on at least one occasion. I have also experienced various VR headset solutions in the intervening years and so I feel those experiences helped to manage my expectations. My custom build PC specification is a Intel i7-6950X paired with 64GB of Quad-channel system ram and a Gigabyte GTX 980 Ti 6GB running Windows 10 Professional (Anniversary Edition). The system is not overclocked but is configured to run as fast as non-O/C settings will allow. For my first extended jaunt into Gaming VR I picked Elite Dangerous: Horizons v2.2 as my target and I am impressed at the level of detail Frontier Developments have put into their game. After playing at 1080p on a 144Hz NVidia 3D capable monitor for a long time the move to the sub-1080p per Eye VR experience (1280x768 Game Resolution) was a pleasant surprise. I had tried non-head tracking nVidia 3D and while it was visually impressive I found the experience lacking to the point I avoided playing it in 3D. However, despite the lower resolution of the VIVE (compared with the 3D monitor) the addition of room scale head tracking has proven to be a deal clincher. 1024x1200 per eye is a bit too low a resolution to be able to read all HUD presented text in ED:H without having to lean in towards some HUD components to get a closer look and on occassion some gaming environment details do suffer a bit for the lower resolution but the overall experience kind of makes up for the deficiencies in resolution. An example of where it makes a real difference for me is when docking at a Coriolis station since the head tracking allows me to visually locate my docking space a bit quicker (not by much but enough). The headset audio is a bit too loud out of the box in my opinion and adjusting in-game settings did little to improve matters. However, it is just about tolerable. 1. If you do not plan to use Bluetooth (a 4.1 device is built into the Headset base station) then you will need 2 long micro-USB cables. 2. The wall plugs provided with the kit (intended for plasterboard walls) do not appear to be fit for purpose. I would try to source some better ones with advice from a local DIY store. 3. The on-paper instructions with regards to setup are severely lacking to the point of not even mentioning the necessity of Bluetooth or USB connections and unlike the hand controllers do not appear to be pre-paired with the headset base station (could not complete setup until I used two long micro-USB cables). The base stations do not have to be wall mounted if you have shelves in the right places but it is probably better if they are. For initial testing/review I have one wall mounted and one sitting on a shelf just above seated head height and the system seems to work from the seated position with no obvious issues. The provided headphones are not of the best quality but not the worst either (about equivalent in sound quality to my JVC sports headphones) and they plug into a standard 3.5mm jack that is loomed over the top to the back of the head strap. Given this it would be easy to replace them with something of better quality if you felt the need. My only complaint about the provided ear-bud headphones is sometimes they can slip out as there are no hooks to keep them in place. The SteamVR application which is what seems to be the main integration software is ok but it seems that once you have installed the SteamVR that games that have both a VR and non-VR mode (such as Elite:Dangerous) can get stuck in VR mode regardless of whether it is how you wish to play the game. Games appear to have to be specifically modified to work with the VIVE and currently the list seems rather short. Mainstream titles that could benefit from it (Fallout 4, Witcher 3, Dragon Age: Inquisition) do not appear to support it. At this point in time, I can not recommend any VR gaming solution as the cost seems to outway the current list of supporting titles at this time but IMO it is probably worth it if you play any of the supported titles (such as Elite Dangerous) ALOT. Was promised my bundle code via email ?? nothing yet Overclockers? The vive headset isn't cheap, but in a moment of madness, I decided to buy one. The first thing to state is that watching videos of VR does not in anyway represent the experience. With everything set up correctly, and HTC's full room tracking, your really are there. This really is the next evolution of gaming. After the first day of owning this, I noticed my legs were a bit sore, I'd used it so much. Gaming and exercise to boot! The resolution isn't great, I personally can see the pixels. But it's more like wearing a mesh than staring at a screen. It doesn't, in my opinion, take away from the experience. What surprised me is that I still needed to wear my glasses when using it! I'm short sighted, so figured with screens close to my eyes, I'd not need them. The first few hours, I thought things were quite blurry... until some googling told me I still needed my lenses. If you have the money to spare, you wont regret buying this. Each thing I try leaves me grinning like a crazy person. I'm giving this headset full marks, not because it's perfect, its not, but because it's SOO much of a leap from playing games on a screen and it works brilliantly! HTC have clearly worked hard on providing a good experience from the moment you get the box as the setup process is simple and guided (you open the beautiful box and are presented with a quick guide basically telling you to download the software, from there the software guides you through connecting everything) and once set up everything is managed IN VR from the steam VR Hub. It's very well thought out and it works soo well. I have been following VR developments for years and have a couple of google carboards as well as having tried the Oculus rift DK1 and had a loan of the DK2 so i'm no stranger to VR, but this blows them all out of the water. The screen is much sharper and clearer than the DK2 (yes you can still see the pixels if you look but the screen door effect is very minimal now and you don't really notice and resolution issues once you start playing) and the sense of presence you get by having the motion controllers is simply breathtaking. Each time I try a new experience i'm blown away again! Room scale VR is the future! The only downsides i'd say so far are that no matter how big your play space, you'll want more (not sure how they are going to overcome this) and it's going to be a while before game devs really get to grips with making GOOD full blown games in VR. The selection of PROPER games (not just tech demos) is pretty limited at the moment, but that said the free software bundle contains three of the best games you can get for the Vive currently. No video on youtube or person talking about it on youtube is going to do it any justice. It really is one of those you can't understand unless you try it situations. An as a gamer for over 30 years, it's the most mind blowing experience I have ever had with any sort of digital entertainment period. Games that look basic and a bit rubbish on youtube or just some pong early access tripe might well be one of the most immersive and fun experiences you have ever had. Until you try it you won't understand. Too many mental trippy experiences to list here, just know that it's a completely different form of entertainment to anything you have tried before. This is just the start and thing will only get better, I say bring it on! VR is no marketing gimmick. I didn't think it was to begin with, but some may think it is. One has to actually try VR to truly understand how much of a step forward in gaming it is. The feeling of complete presence in your virtual environment is breathtaking, to say the least. The HTC Vive offers both seated VR and roomscale VR. The seated VR experience can be enjoyed fully at the moment in games like Project CARS and Elite Dangerous. Despite some loss of fidelity over a high-resolution monitor, the feeling of scale and presence is so absolute, you get totally hooked. Looking around the cockpit of your ship in Elite Dangerous as you approach the surface of a moon and navigate its craters and valleys, all in glorious 3D VR covering your field of view and tracking your head movements perfectly, is one of those things in life you simply need to experience! The roomscale VR experience is something else and you'll happily play simple games just for the experience. Being able to walk around, peak, crouch, crawl and jump and fully interact with your virtual environment is something that cannot be underestimated - it is absolutely incredible. The HTC Vive controllers feel extremely natural in your hands and truly feel like they were built for interacting with a 3D environment in roomscale. Since this level of VR technology is still young, the market is fresh. Roomscale VR games are constantly making it into Steam and there are already many that are absolute must-haves, and more are coming constantly. Some AAA VR games are being released later this year, such as Doom and Fallout 4, built around VR. The build quality of the HTC Vive is fantastic and the setup is very quick and easy to carry out once your Lighthouse stations are mounted high up on walls in your room. SteamVR guides you through the entire process and the hardware connects to SteamVR flawlessly and quickly. The only downside I see to using the HTC Vive is that after a number of hours of full immersion in virtual environments, you take off the headset and see the blandness of the real world and can't help but feel disappointed. Nevertheless it takes a few hours a day for a few days to get used to VR. The first day or two, I would take off my headset and feel oddly surprised that the desk and monitor in front of me were 3D objects. As always, Overclockers provided an excellent standard of service with extremely quick delivery. The only downside was the lack of Haribo! :) Thank you! WOW - This is on another level! I ordered this product and OCUK delivered it the next day as expected. I set it up and had enough room for room scale to which I enjoyed playing the free three 'games' that came with it. This product is simply amazing, you feel like you are their even though you know you aren't. I tried the oculus rift and didn't enjoy it as the HTC Vive controllers are sublime! You can see them in VR at the same scale and it maps them correctly. I showed my parents this and my mother experiences terrible motion sickness in general but when I put her in war thunder she felt fine and was enjoying the experience. The only time she felt sick was when the plane was going in a loop. The only downside is the resolution but you don't notice it once you start playing games. But other than that, if you have the money buy it! This is an amazing thing I love it. Only downside is movies, stuck to watching in theatre view. 360 videos I've tried are so bad in quality.